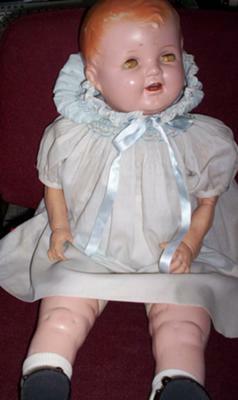 What company made this doll? This doll is marked on the back of the neck but the head is composition & cracks make the mark hard to read. It appears to be an elongated diamond like this: < > with approximately 4-5 letters that appear to be JOE_? or could even be IDEAL? It's a fat baby with molded hair painted blonde, blondish brown eyelashes, faded sleep eyes that look light brown, open mouth with 2 upper & 2 lower teeth, composition legs, firmly stuffed cloth body with cryer box inside & heat damaged hard rubber or soft vinyl arms with no signs of ever having stuffing. Any help would be appreciated and info can be sent to aleo52 at yahoo dot com!